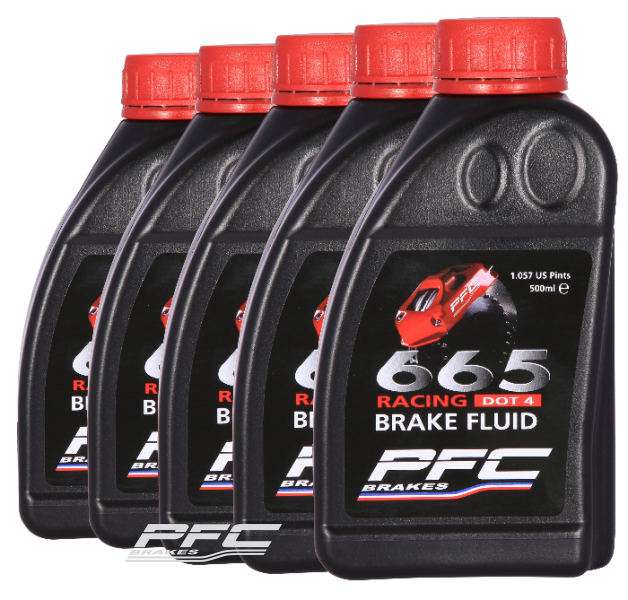 PFC Racing high performance brake fluid has been specially formulated for fast road, trackday, rally & race applications, where braking systems operate at very high temperatures. A complex mixture of Glycol Ether Borate Esters and Polyalkylene Glycol Ethers together with advanced corrosion inhibitors, antioxidants and other modifiers results in an exceptional brake fluid with not only a very high boiling point but which also conforms to FMVSS 116 DOT 4 and maintains its class leading viscosity, lubricity and compressibility performance at extreme temperatures to ensure braking system reliability and performance and a firm, consistent pedal. RH665 has the highest GUARANTEED minimum Dry Boiling Point (ERBP) of any DOT 4 Brake Fluid, 325°C, to guard against vapour lock and give a firm and consistent pedal even under extreme racing conditions. Many manufacturers quote “typical” boiling points – do not be deceived, this is not the minimum specification that you could receive, it can be the result of a test on a single sample. “Typical” values for RH665 are invariably higher than 325°C. A similar situation applies to “Wet” Boiling Point. RH665 is GUARANTEED to be above 195°C – “typical” values are much higher and at least the equal of other leading brands. Boiling point is of course not the whole story. With brake fluid it is essential to have the correct balance of properties to get a good overall result. Low viscosity is very important to ensure a good bleed, low compressibility is essential for a firm pedal and lubricity is vitally important for efficiency, pedal return and life of the brake system. BEWARE: Many racing brake fluids do not meet the viscosity requirements of DOT4. RH665 Racing Brake Fluid conforms to and exceeds all aspects of the U.S. FMVSS 116 DOT 4 specification. This means that it has been tested and is compatible with all the rubbers (SBR, EPDM etc) and metals commonly used in brake systems and will not damage them. It also means, of course, that RH665 is entirely street legal. BEWARE: Many racing brake fluids on the market do not conform to FMVSS specifications and therefore cannot be guaranteed not to damage your brake system. RH665 can safely be mixed with other DOT 4 brake fluids – however, this will degrade their exceptional properties. PFC Racing Brake Fluids are not suitable for use in contact with Magnesium components or in mineral oil based systems. For best results bleed the system with fresh fluid before each event and when the brakes have been excessively hot and/or the conditions are especially humid. Always follow the vehicle manufacturer’s recommendations. 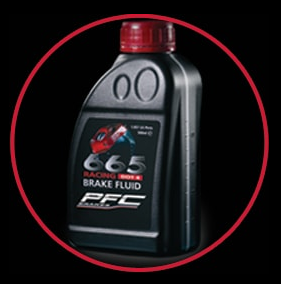 PFC Racing Brake Fluid is not the same as other racing brake fluids.